Posted on September 1, 2016 | Comments Off on Are You Getting Enough Potassium? One very important key to wellness is potassium sufficiency. Essential for good health at the most basic level, potassium is critical for the proper functioning of all cells, tissues and organs. Potassium is not stored in the body and must be obtained through a healthy diet of potassium-rich foods and supplementation as needed. Although the Institute of Medicine and the USDA recommend 4700 mg of potassium per day, and the World Health Organization recommends an even lower amount of 3600 mg per day, the typical American falls far short with an average intake of 2640 mg per day, about half of what is needed to support overall heath and avoid potassium deficiency. Unfortunately, one of the many problems with the standard American diet (SAD) is that only a very small percentage of the population actually consumes the recommended number of servings of fruits and vegetables daily to ensure proper amounts of potassium. The SAD diet tends to include fast foods, processed foods and restaurant foods, that unfortunately are high in sodium and very low in potassium and other essential nutrients. Excessive sodium intake negatively affects fluid homeostasis and puts extra strain on the kidneys, which must filter the blood and control fluid levels. A quality diet rich in potassium helps to offset the negative hypertensive effects of processed salt. Electrolyte balance – As an electrolyte, potassium helps to conduct electrical charges within the body and maintains the balance between the electrical and chemical processes that support vital functions. Along with sodium and other electrolytes, potassium helps to regulate the balance of body fluids, which affects nerve signaling and muscle contraction and impacts the cardiovascular system. Stroke prevention – Research shows that potassium-rich diets reduce stroke risk for both men and for women, who are particularly at risk of dying from stroke. Potassium acts as a vasodilator, which helps blood vessels to relax and allows blood to flow more freely, thereby reducing the risk of clotting that can cause stroke. Brain function – High levels of potassium allow more oxygen to reach the brain, supporting cognitive function and stimulating neural activity. Potassium plays a key role in maintaining electrical conductivity of the brain, and helps to moderate and regulate electrical transmissions throughout the body. Cardiovascular health – Low potassium levels can cause heart rhythm disturbances and muscle weakness. Research has shown that those who are at the greatest risk of developing cardiovascular disease are those whose diets are both high in sodium and low in potassium. Those who consume too much salt and too little potassium are more than twice as likely to succumb to a heart attack. Blood pressure support – Potassium helps to lower blood pressure by helping the body to secrete sodium, balancing out the negative effects of sodium on blood pressure. Potassium is a crucial mineral for regulating and supporting healthy blood pressure, as studies have shown that low potassium intake is linked to high blood pressure, heart failure and stroke. To reduce high blood pressure, lower sodium intake while increasing potassium consumption. Bone Health – Existing evidence suggests that a potassium-rich diet positively affects bone-mineral density, especially in older women. Studies show that when potassium intake increases, urinary calcium excretion decreases, leading to improved bone mineralization. Muscle Function – Sufficient potassium is required for normal muscle contraction and relaxation. Potassium helps to maintain optimal nerve and muscle function and supports natural reflexes by stimulating neural connectivity of the muscles and the brain. Low potassium levels are linked to muscle spasm and leg cramps. Sufficient potassium intake make help prevent cramping and painful spasms. Potassium deficiency may be an underlying side effect of a medical condition. If you are taking medications or have a medical condition, please consult a healthcare practitioner before supplementing. Individuals taking ACE inhibitors, angiotensin receptor blockers or potassium-sparing diuretics may require monitoring of potassium levels. Potassium (Citrate) by Pure Encapsulations – This product supplies 200 mg of potassium citrate, along with vitamin C, in support of numerous physiological functions, nutrient metabolism, muscle function, and cardiovascular health. Gluten and soy free, Non-GMO vegetarian formula. Potassium by Nutritional Frontiers – This combination formula provides 99 mg of potassium aspartate, along with niacin and vitamin B6, in support of optimal utilization and absorption for proper nerve and cardio functions. Gluten free vegetarian formulation. 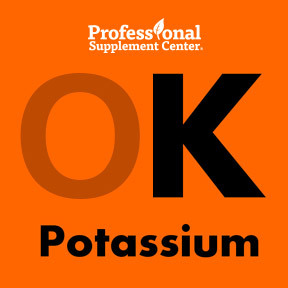 Potassium-HP™ (with magnesium) – This high potency powdered formula provides 1200 mg of potassium citrate and 120 mg of magnesium citrate. It is intended for use solely under the advice and guidance of a healthcare practitioner. Gluten and dairy free formulation. Potassium Citrate by Now Foods – This well absorbed and highly bioavailable formula provides 99 mg of potassium citrate in support of electrolyte mineral balance and nervous system function. Gluten and soy free, Non-GMO formulation. Potassium Citrate 400 by Biospec Naturals – This formula provides a clinical dose of potassium citrate along with citric acid in support of critical bodily functions, proper metabolism, cardiac function and energy production. Suitable for vegetarians. Comments Off on Are You Getting Enough Potassium?